With the balance of the U.S. Supreme Court in question, abortion rights advocates are beginning to prepare for a future they hope never to see - one without the protections of the Roe v. Wade decision. The confirmation of President Trump's nominee for the court, Judge Brett Kavanaugh, would not necessarily mean that decision would be overturned. But we have new reporting this morning about how some abortion rights groups are, in fact, already preparing for that to happen. It comes from NPR's Sarah McCammon, who is in our studio this morning. Hi, Sarah. GREENE: So remind us - I mean, so many headlines about this and the possibility of Roe v. Wade being overturned and what that could mean. What exactly could be at stake here with this changing court? MCCAMMON: Right. I mean, if Kavanaugh is confirmed, which isn't a foregone conclusion yet, there's no guarantee that Roe v. Wade - the 1973 decision that legalized abortion - would be overturned. But a lot of legal experts think it's very likely that it would be, or at least substantially weakened. 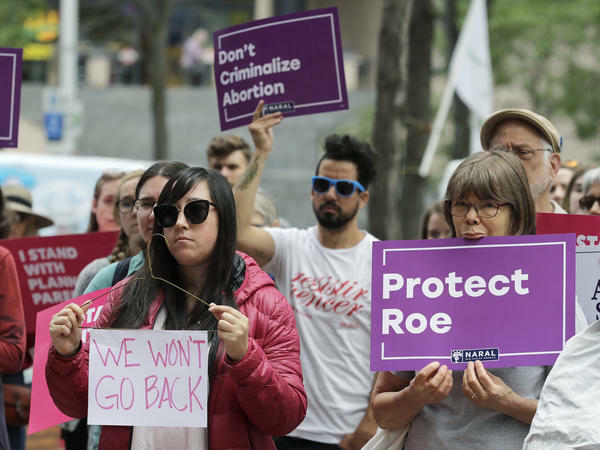 And that would give the say back to the states, letting them have a lot more latitude to restrict abortion, which has reproductive rights advocates worried. I talked to Leslie McGorman with NARAL Pro-Choice America about this. MCCAMMON: So NARAL and other groups are trying to do a couple of things. One, they want to block Kavanaugh's nomination. But second, David, they're also looking ahead to state legislatures to try to prepare for this possibility that abortion rights could eventually end up left to the states. GREENE: OK. This sounds like something that's really important to underscore - that if Roe were, say, overturned, it's not immediately that abortion would be illegal throughout the United States of America. This would go to the states. It would begin a real process. So if you're preparing for that process, if you're a group like NARAL, what are you doing exactly? MCCAMMON: Well, they're looking at state laws. Right now, more than 20 states have laws on the book - books that could ban abortion altogether. Or in most cases, if Roe were to go away, activists want to remove those laws. They also want to take proactive measures to protect abortion rights. NARAL has some model legislation to that effect that they'll be putting out. Also talked to the Center for Reproductive Rights. One thing they want to do is make it easier for health care providers, like nurse practitioners, to provide abortions so that if there is a greater demand, say, in more liberal states from women coming from more restrictive states, those providers can meet that demand. GREENE: And I suppose abortion rights opponents - I mean, even if they are feeling like this is a good moment with the court changing in their direction, if a lot of these battles are going to move to the states, they must be gearing up as well. MCCAMMON: Right. And they've been fighting these battles for a long time. Those would intensify. Mallory Quigley is with the anti-abortion rights group Susan B. Anthony List. And she says they're ready. MCCAMMON: So you would likely see a lot of debates about where to draw the line when to restrict abortion in a lot of these states. GREENE: And so I guess we're looking ahead for the moment to Kavanaugh and whether or not he's confirmed. I mean, are activists feeling - how are they feeling on both sides of this? MCCAMMON: Well, this is really the big fight. Both sides see Kavanaugh's confirmation as the major fight. Abortion rights opponents are very optimistic, although they know there's no guarantee that Roe would be overturned in that situation if he were confirmed. Abortion rights supporters, meanwhile, are taking this very seriously. They're trying to stop Kavanaugh's confirmation, but they realize that they may have to prepare for a future where that's not the case. GREENE: All right. NPR's Sarah McCammon. Sarah, thanks a lot.